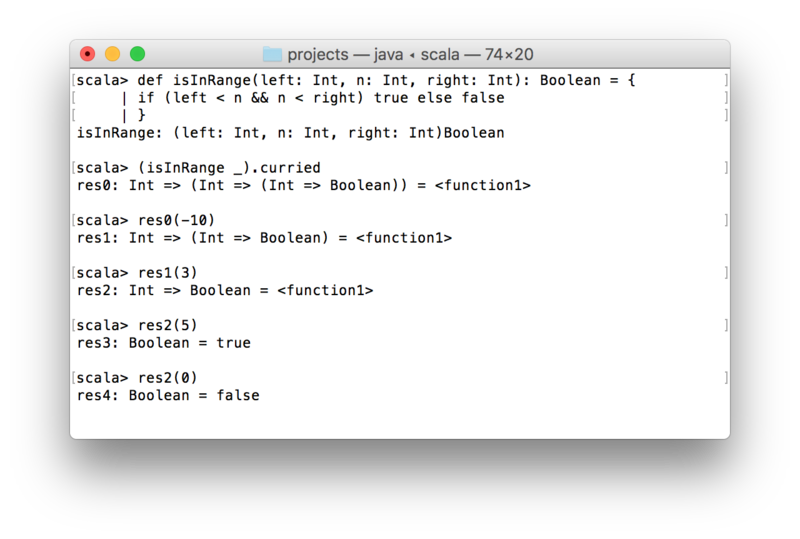 In this article I want to show a real difference between curried functions and partially applied functions in Scala. This question is pretty common for those developers who started learning Scala without previous experience in functional programming. Moreover, this blog post may be useful, even for experienced Scala developers, because based on my experience I have had incorrect understanding of the difference between the curried functions and partially applied functions. So here is the most classic example of misunderstanding in question of currying and partially applied functions. 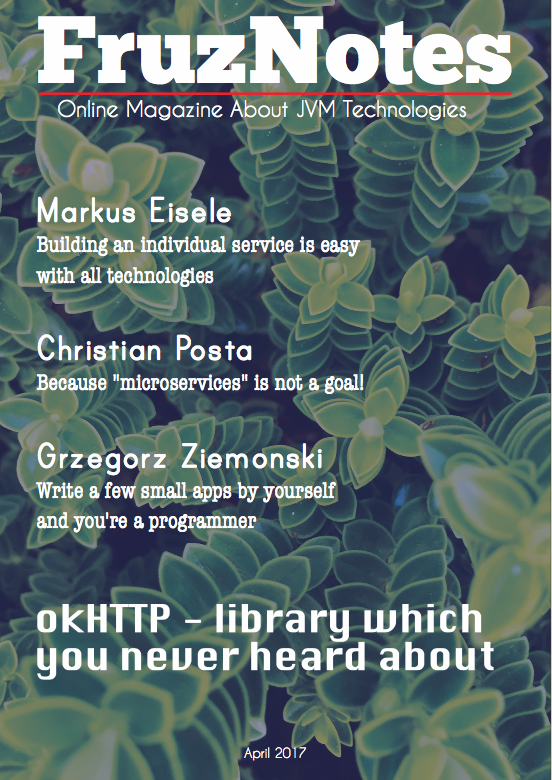 I wrote that article ~9 months ago. Since that time I dived more deeper in Scala and figured out what is a curried function and what is a partially applied function. Before demonstration of code examples, it would be rational to get acquainted with the definitions. For most people it is enough in order to understand what is the difference. Currying – decomposition of function with multiple arguments into a chain of single-argument functions. Notice, that Scala allows to pass a function as an argument to another function. Partial application of function – pass to function less arguments than it has in its declaration. Scala does not throw an exception when you provide less arguments to function, it simply applies them and return a new function with rest of arguments which need to be passed. In general, you can stop reading this article if everything is clear. Otherwise I recommend to look at some examples for each of function types. What happened in the code snippet above? At first I declared function sum. It has two arguments of Int type.Its returning type is Int as well. Then I create a curried version of the sum function. 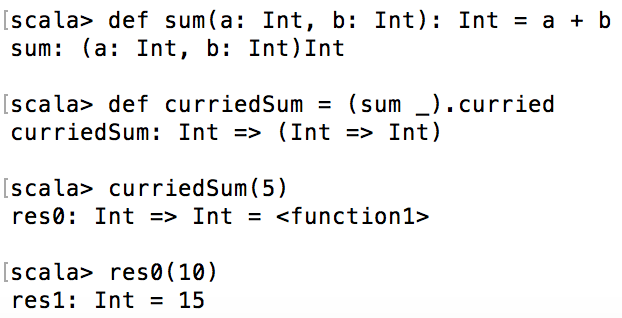 The curriedSum function accepts single argument of Int type and returns a function of Int => Int type. When I pass 5 into the curriedSum I receive back a new function res0: Int => Int (this sample was performed in REPL). Finally, invoking res0 with any Int parameter we will add this parameter to 5. By invoking a curried method on any function of type FunctionN where N > 1, we receive a curried version of the function. The logic of isInRange function is pretty simple: if argument n more than left but less than right, the function returns true, otherwise false. On this screenshot you can see how we pass one by one arguments and as a result we see two boolean results in res3 and res4. Now let’s see how partially applied functions look like on practice. I’m going to use the isInRange function from the previous section. So what happened in the code snippet above? I used isInRange function as a base for 2 new functions: is5InRange and between0and10. Notice, that for missed parameters you can use underscore. Partial application is extremely helpful when you want to create a set of different functions on top of one particular function. In the same way, as I create between0and10, it’s easy to create between50and75 for instance. So after the theory and practice part, I guess you understood how curried functions differs from partially applied functions. Once again: currying – transformation of a function with multiple arguments into a chain of single-argument functions, partially applied function – function which was called with less number of arguments.